Register by April 26th to receive a free #TeamScout race t-shirt! Inclusion at Westbriar means embracing diversity in our community and celebrating the differences that make us unique. It means no one should be left out. #iCare teaches all our students how to be more kind, how to be brave, and how to be a friend to those around them through practical lessons and activities. *Thank you for making our book fair such a success! We couldn't do it without our volunteers and our parent community! 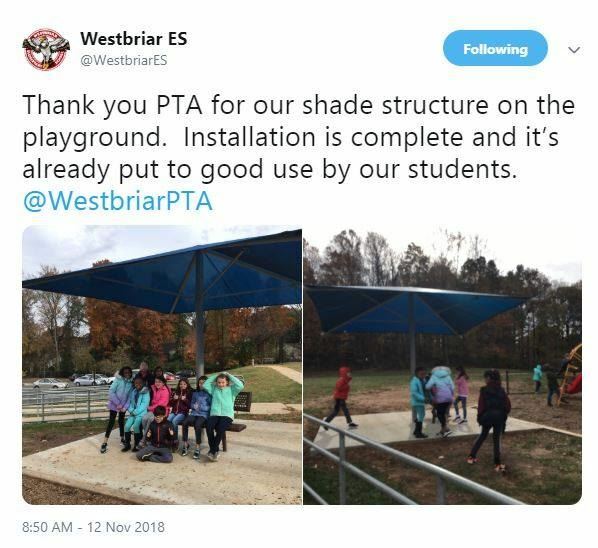 *Shade has been installed on the playground! Thank you for all your help in raising the funds we needed through Feed the Falcon last year! GRACE Arts - No art experience required! This program allows parents of grades K-5 to teach the kids about a new artist each month and do a hands on art project with them. Click here for details. Volunteer! - Click here for a list of PTA Committees that need your help! Follow our link when buying from Amazon! At NO ADDITIONAL COST TO YOU, a portion of your cost is returned to your school when you order HERE or click on the Amazon Logo! 2. Scroll down to the red box that says "For Customers" and choose "register your card". 3. Enter the first three letters of your last name and your Bonus Card number, and then follow the instructions to designate Westbriar (School Number: 02135 or choose from the drop down list). 2. Link your VIC card number to designate Westbriar (School Number is: 7661) as the beneficiary. First time users will need to create an account.